BLIMEY! The Blog of British Comics: Cracker of a mystery comic! Cracker of a mystery comic! 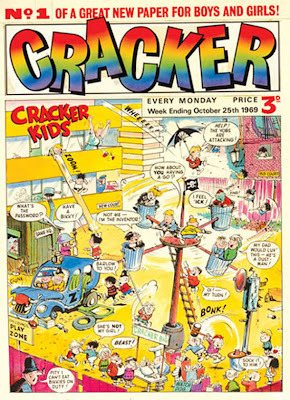 1: The 1969 Cracker was a promotional comic (like Wonder Comic, which was only sold at Esso garages) so had limited distribution. 2: This is the cover to a dummy issue of a comic that was never published. 3: It was published in a test area, never caught on, and was quietly dropped. Anyway, that's my opinion. Does anyone out there know the true story behind this cover? Please leave comments about it if so. Update: Over at the Comics UK forum, Phil Rushton has noticed that the cover bears no free gift announcement - a very unusual thing for a sixties comic! This would indicate even more, in my opinion, that "Cracker" was only a dummy comic. Which may make the artwork more collectible for some! Hi Lew, I hazard a guess that you might have picked up on this title from my posting on the Down the Tubes blog (????). In which case I'm chuffed to have randomly picked such an interesting picture. But a great spot on your part that thus title may never have appeared. I did indeed Richard. My apologies for not crediting you, which I've now rectified. Hope you're well.